Last month, I had my first KitchHike at home. “KitchHike” is a web service which allows you to treat your homemade food to people who want to try it, or on the opposite, to try other people’s cuisine at their house. As a cooking-lover, I definitely had to try it! Then, I prepared a homemade Italian full course for the three people who visited me. “Paccheri” with shrimps, squid and fresh cherry tomatoes on cream of green peas. Mainly, I cooked some dishes my mum used to prepare at home in Florence (but they’re not always typical Florentine dishes) and some from Tuscany cuisine. 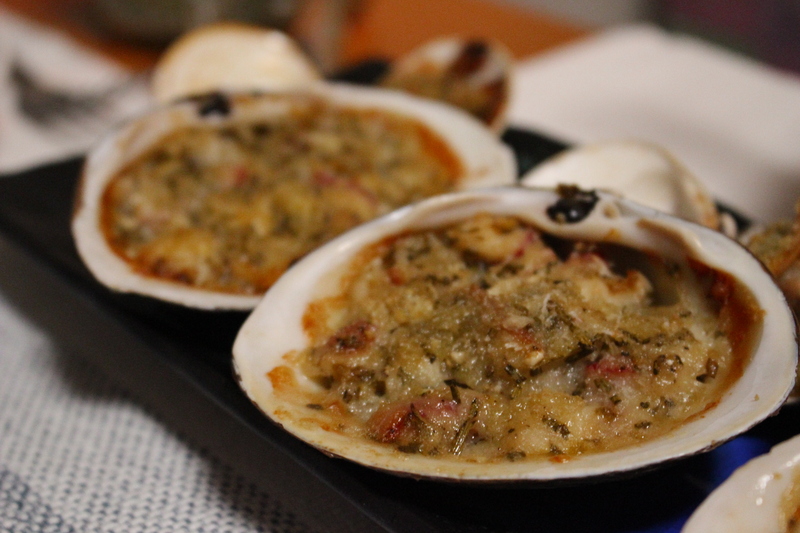 My grandmother used to prepare gratin of mussels (or scallops) almost every year for our family dinner at Christmas. Unluckily, I didn’t find them this time, so I had to change a little the recipe using clams and surf clams (“hokkigai”) instead. 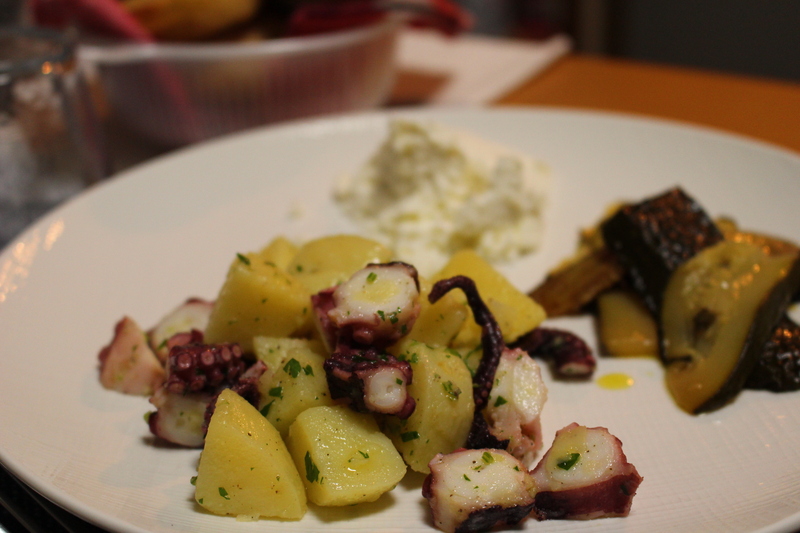 Octopus salad and vinegar&mint zucchini are also dishes that used to be served frequently at home. 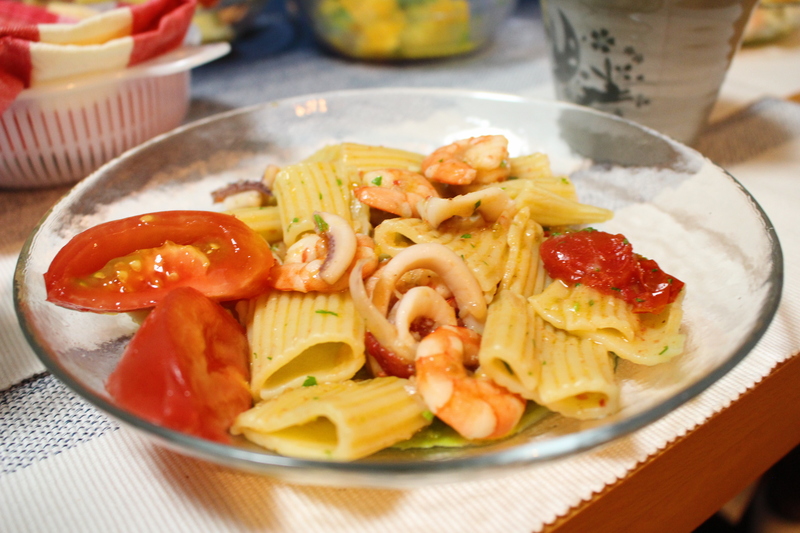 “Paccheri” (a kind of pasta) with shrimps, squid, tomatoes and green peas’ cream is not really a typical Italian families‘ dish, but my mother prepared it many times and we all loved it, therefore it might be considered a “typical dish” at my home. 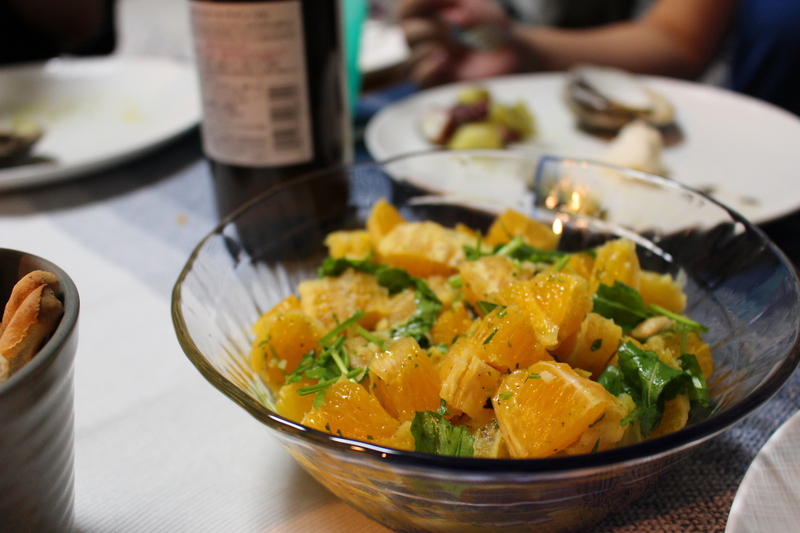 Then, oranges and rocket salad. You see, fruit is not always a dessert. Garlic, parsley, black pepper and olive oil made it a fresh salad perfect for summertime. Semolina is a kind of flour which is usually used to make pasta. 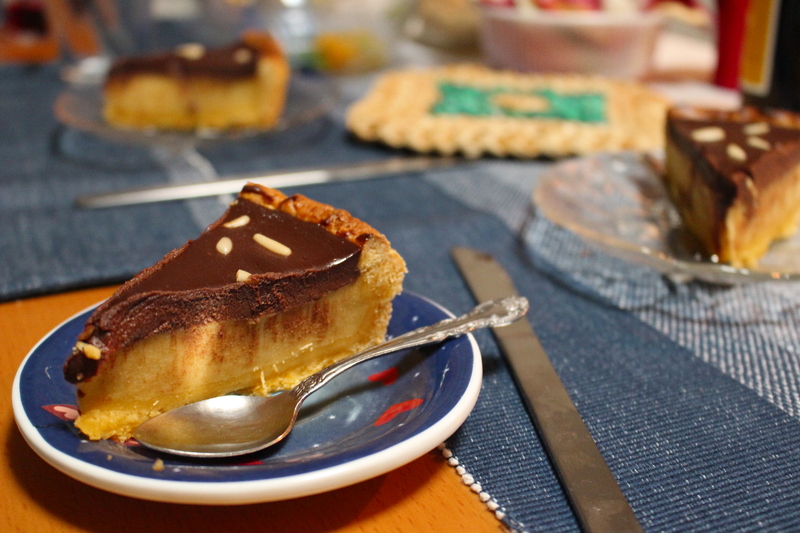 In Italy, you can also find it in other dishes, for example in this tart. If you’d like to try it, you’re always welcome to my kitchen! 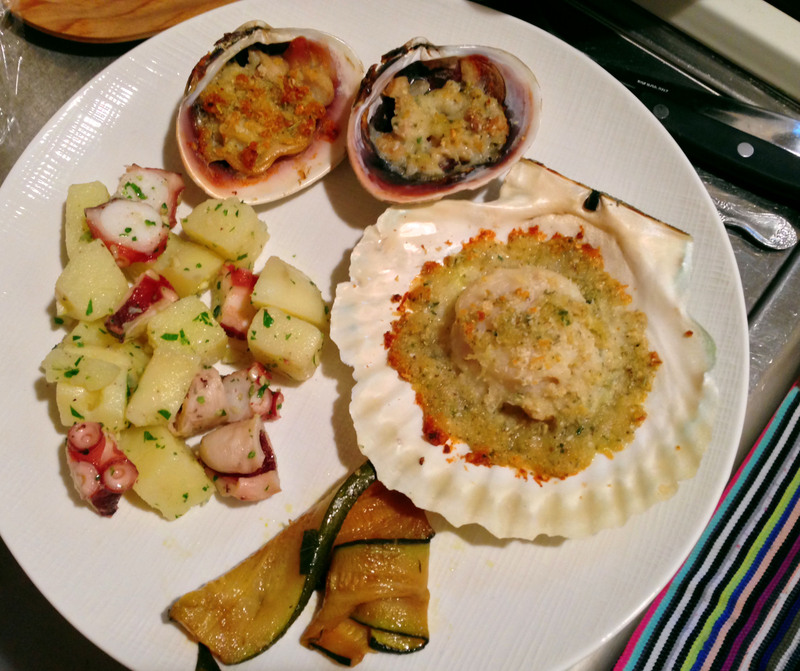 It was the first time for me to use KitchHike, so I was a bit nervous, but it was really fun! Well, I already have to prepare for next KitchHike!